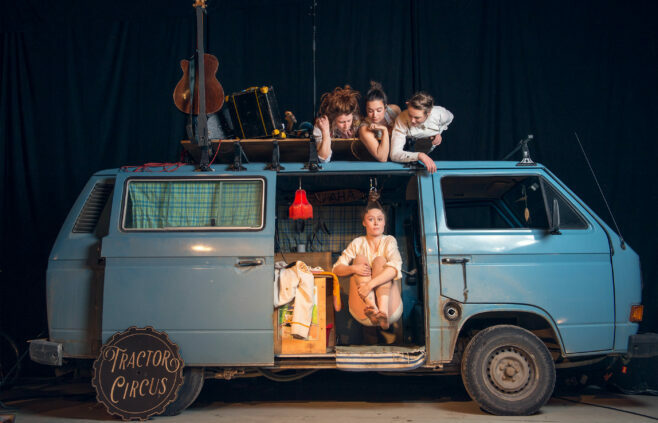 Tractor Circus Project want to bring contemporary circus to the villages of Scandinavia. Farmers and villagers let them use their tractors and farm yards, receiving a performance and new experience in return. With two vans and two tractors the company turn the village up-side down for a weekend. Tractor Circus Project want to create a meeting place for all cultures, social backgrounds and experiences – to encourage people to play and to dream together with them. They also host workshops connected with the performance. Language: Songs with lyrics. Please note that the lyrics in several songs are in Swedish and some in English. If there would be interest for an international tour, the Swedish lyrics will be translated into English. The performance is created for farm barns and outdoor venues. Tractor Circus Project brings together four Nordic artists: three circus artists and one musician. They wish to meet people where they live, bringing their work to people’s homes and everyday lives instead of inviting them to the theatre. In 2017 they began their work with the creation of a 30 minute piece in collaboration with Odin Teatret. This was performed at Festugen in Holstebro, going on to tour in Denmark. In May 2018 the performance was developed into a 45 minute piece that has been performed in Denmark and Norway. With the support of Odin Teatret and Troels Rosenkrantz Andersen.